One daily tea spoon, as part of a balanced diet. 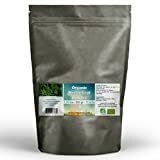 This entry was posted in Organic Health Products and tagged 1.10, 500g, Leaf, Nettle, Organic, Powder by Organic Health. Bookmark the permalink.